An epoxy putty used as a filler. PC-Lumber™ Epoxy Putty is pre-measured and mixed by hand. It is used as a filler where a small amount will solve the problem. Within 60 minutes it is cured and ready. The putty can be easily formed and shaped. Wear disposable gloves to minimize contact with skin. Use denatured alcohol, acetone, rubbing alcohol (isopropyl alcohol) or lacquer thinner to cleanup before PC-Marine cures. Clean hands and skin with soap and water. How soon should PC-Lumber™ be sanded? 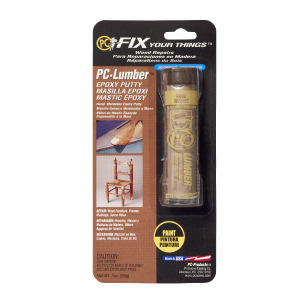 PC-Lumber™ can be sanded after 60 minutes cure. Does PC-Lumber™ accept wood stain? PC-Lumber™ will accept stain after sanding. However, the type and color of the stain will have a different effect on the PC-Lumber™ than the surrounding wood. Stained PC-Lumber™ will not have the natural tone of wood. 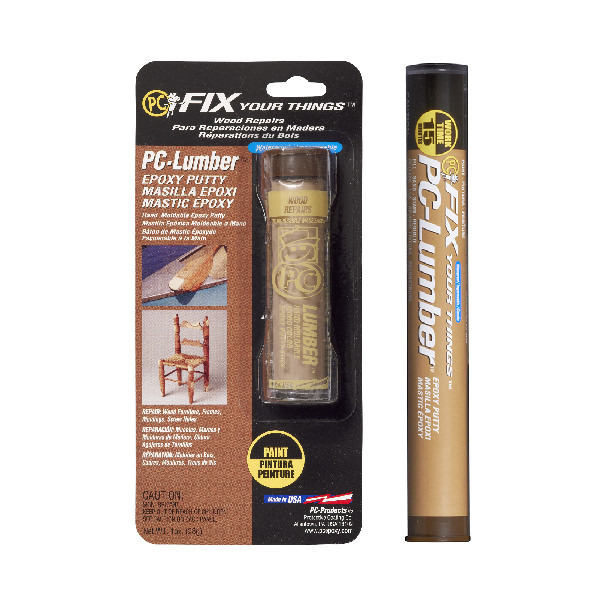 Various colors of paint and stain markers make it possible to conceal or camouflage areas filled with PC-Lumber™. What is the best way to repair stripped threads? Rather than try cutting or tapping threads into cured PC-Lumber™ it is better to set the screw into the mixed epoxy and cure in place. If removal is required apply a release agent to the screw threads prior to setting in place. Can PC-Lumber™ be used for exterior applications? PC-Lumber™ is not affected by dampness or water. Exterior applications should be protected from damage by UV with a suitable exterior coating. 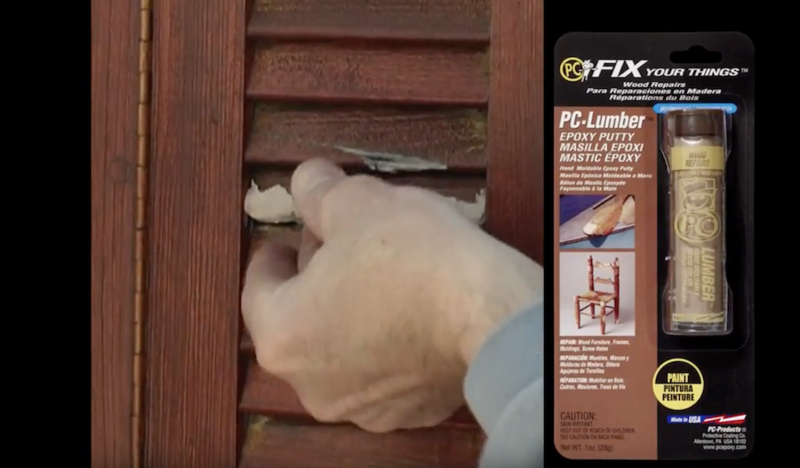 How thick can PC-Lumber™ be applied? 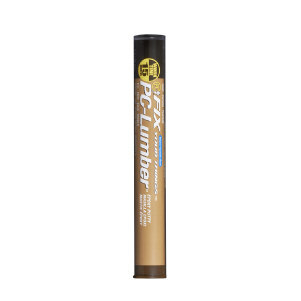 PC-Lumber™ can be applied in any thickness. It does not shrink or dry. PC-Lumber™ can be shaped, molded or sculpted in to any shape. It is excellent for repair to decorative molding and antique wood clocks. There is a halo effect around the cured PC-Lumber™? Apply the stain before filling with PC-Lumber™. PC-Lumber™ does not have the same natural colors as real wood. Use paint markers or use other stain colors to disguise the repair. Natural grains in the wood are difficult to match. Use an opaque type of stain or paint.